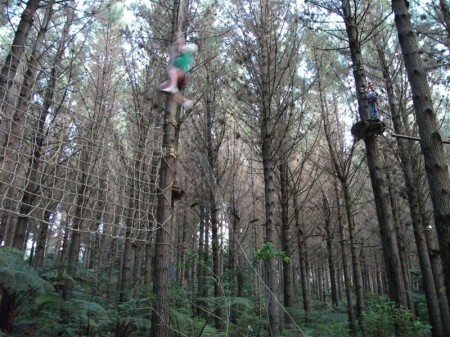 This afternoon I took Ellie, Milly, Sam and Jacob out to the Adventure Forest for some high tree top challenges! I decided I needed to do it as well, and I’m glad I did, even though a couple of the activities stressed the weak muscles in my old broken leg somewhat. Milly is on the left in the photo; I’m waiting at the right hand platform, twelve metres up. The de-briefing before we started was vital of course. We had a comprehensive safety talk, and learned how to use the harness and the karabiners – and the absolute importance of using them the right way, in the right sequence etc. A great analogy of how vital it is for us to listen to God’s de-briefing; to pay attention to his warnings and his advice. Only then can we explore the heights safely, and make it to the end of the adventure! Great analogy. I had always struggled with heights. Used to get white spots when on anything above table height. Although absolutely love flying in planes (comes from my fraternal side). When I was painting the house I decided it was time to give the fear over to the Lord and trust HIM to always keep me safe.